America’s relations with India should also be seen in this context. Recent agreements signed between the US and India validate the fact that a rising China is a threat to the regional balance of power. The US is also concerned about the rise of Chinese economic power in the region. Dr. Ahmed Albanna, UAE Ambassador to India declared that China’s investment for expanding Gwadar port in Pakistan will have negative impact on the UAE’s interests. 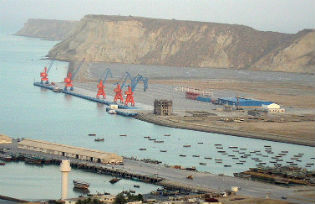 Qatar officials understand the importance of Gwadar as a great game-changer in the region and they planned to invest 15% of the “China–Pakistan Economic Corridor” (CPEC), a collection of infrastructure projects that are currently under construction throughout Pakistan, so that to put pressure on Dubai and the UAE as the animosity between the two country has recently became more harsh. To sum up, the geoeconomic and geopolitical situation in South Asia is changing swiftly. This can be credited to the fact that the emerging powers in the region are redefining their presence. China, Pakistan and Qatar are formulating the economic agenda of the region based on the geo-economics of Gwadar port while India and the UAE are strongly against this prospect and attempt to thwart their plan by persuading the USA and European countries to invest in Dubai. Saudi Arabia and Kuwait have natural oil resources and Qatar has natural gas resources but the UAE has no special resources and is mostly dependent on its tourism and transportation revenues. Thus, with regard to the large investment by Saudi Arabia for attracting tourism by turning 50 Red Sea islands into luxury tourism resorts and the silent economic war in the Gulf of Oman, the UAE is the big loser of the this great game since Dubai will have no tourism and transportation privileges ten years from now.